I don’t think it’s an exaggeration to say that the experience of attending shows at the De Montfort Hall profoundly influenced our lives. And it wasn’t just that we had the good fortune to see some of the greatest bands of the era. Some of us, like Al Roberts, Steve Hill and Glenn Williams, went on to have careers in the music business; others, like myself, went on to develop a lifelong love for music that is now being passed on to the next generation. Steve Hill: The whole industry was in its infancy in those days–you were just getting into the big PA rigs, the big lighting rigs, visual effects, even pyrotechnics. And a lot of people made a lot of mistakes. Uriah Heep had these dry ice machines–frozen CO2 in great big buckets like a kettle. And you’d plunge it down into boiling water, and these massive clouds of white smoke would just engulf the bottom of the stage. And of course it went into the audience, and I remember being at the gig and passing out because there was no oxygen. Bruce: We had to evacuate our great vantage point at the front of the stage when that happened, and I remember David Byron, the band’s lead singer, apologizing after the first number for overdoing the dry ice. But the craziness was just beginning. The show was the last night of the Wonderworld tour, and I think everyone on stage was pretty buzzed. I know Byron himself downed a whole bottle of Mateus Rose during the show. For the encore, drummer Lee Kerslake ran on stage with a fire extinguisher and sprayed down his entire drum kit. The warm-up that night was Peter Frampton, two years before the release of Frampton Comes Alive! I had no idea who he was, but I remember thinking that talk box was pretty cool. Bruce: As Steve Hill said, elaborate stage shows were still in their infancy in the seventies, but the Rainbow show was very much a game changer and a sign of things to come. 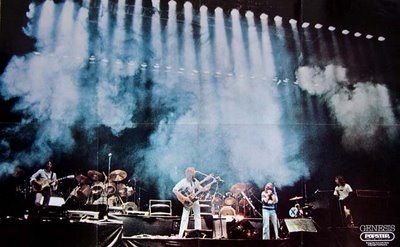 Paul Canny: Rainbow brought a state-of-the-art stage show–a 30-foot electronic rainbow spanning the stage. Groundbreaking stuff. I remember Ronnie James Dio running on to a hero’s welcome even though nobody really knew him from Adam. Bruce: And I remember that cool moment midway through the show when Ronnie introduced the rainbow and waved his hand in a large semicircle as the lights above him followed along. Not to be outdone, Genesis brought forty-eight Boeing 747 landing lights along for the Wind and Wuthering tour. Simple stuff by today’s standards, but when they turned them all on during “Afterglow” at the end of the show, we were awestruck. Glenn Williams: That was the first time I saw a laser at a concert. The smoke drifting through gave an astonishing effect. Paul Canny: You were allowed to smoke back then as well, and I remember the atmosphere at the Lynyrd Skynyrd gig being so thick with wacky baccy smoke everyone was slightly high whether they smoked or not. Bruce: I remember they bought a little kid on stage to wave a Confederate flag during “Freebird.” Then a huge area to the right of the stage cleared out during the long guitar passage at the end as people danced like crazy. Hard to believe that eight months later Ronnie, Steve and Cassie would all die in that plane crash. Bruce: Not really one of the “good’uns.” Actually, this was an eye-opener–my first encounter with the fickle nature of the music business. I was a huge Mott fan, and loved Hunter’s first solo album, so the choice between studying for my Lower-Sixth finals or seeing one of my idols was a no-brainer. Sadly, I was one of the few kids in Leicester that seemed to feel that way that night. One of about 300 in all probability. I have no idea why the De Mont was so empty, but I do remember that “Roll Away the Stone,” played solo on piano, was incredibly moving. The truly awful Vibrators opened the show, forcing most of those in attendance to avoid the phlegm flying from the audience to the stage and back again and head to the bar. Glenn Williams: A rather perplexing gig all round. It was his Overnight Angels tour and I think Earl Slick was with him. Bruce: The day after my eighteenth birthday, Sabbath came to town. But the talk of the night was the warm-up band, an unknown American group that had just released their first album. Now most Brits aren’t very fond of loud, brash Yanks, and when Dave Lee Roth strutted onto the stage and shouted, “Weeee’re Vaaaaaaaan Haaayyyylennnnnn” into the mic, a whole bunch of the audience around me shouted “F#!k off!” right back and prepared to spend the next forty minutes in the bar. Then the band launched into “On Fire” and instantly gained two thousand fans. Bruce: Going to a punk or New Wave show sporting long hair in England in the late seventies and early eighties was a risky move. I’m not exaggerating when I say that you were pretty much taking your life into your hands. But I was a huge Jam fan, and couldn’t resist going, so I enlisted Mr. Williams for moral support. The band were their usual incredible high-energy selves and well worth taking the chance that we might get the crap beaten out of us. But to be safe, we came in late and pretty much everyone was inside. We hung right at the back of the hall where no one would see us, leaving during the encore and legging it over Victoria Park to the relative safety of The Old Horse for a quick pint before going home. Bruce: It would be hard to recall another show that rivaled this one for sheer drama. Back in the day, artists would time their tours to coincide with the release of their new album, but by the time the tour began four days earlier, Gabriel’s third album still hadn’t materialized–rumor had it that he didn’t like the first mix and had delayed the release date so he could go back into the studio and remix it. It eventually came out that May. But Gabriel insisted that the show should showcase his new material, so the audience was confronted by a number of songs that they had never heard before interspersed with more familiar material from the first two albums. With the opening drum beats of “Intruder,” the house lights went down, and the band, dressed in work overalls, began to walk from the back of the hall and through the crowd toward the stage, establishing an unsettled feeling that continued for the rest of the performance. At one point in the show, Gabriel took a backward trust fall off the stage into the crowd and crowd surfed, which I’d never seen an artist do before. Then he used a wireless mic–again, the first time I can recall an artist using one–to sing, first in the balcony, then in the stalls, where he popped up immediately behind me and shook my hand as he walked past. Bruce: Sky were the prog rock outfit formed by classical guitarist John Williams. The show itself was forgettable except for a brief moment that only the De Mont could produce. Part way through the show, Francis Monkman, the former keyboard player for Curved Air, climbed up the choir steps at the back of the stage and played Bach’s “Toccata and Fugue” on the pipe organ. It was the first and only time I ever heard the organ played. When he hit that ominous low chord in the introduction, the whole building shook. Yeah, I know Motorhead were probably the loudest band to appear at the De Mont during this time. But even they didn’t shake, rattle and roll the De Mont’s foundations the way Mr. Monkman did that night. Bruce: The so-called New Wave of British Heavy Metal was getting ready to explode, and nowhere was it more evident than at Def Leppard’s show on April 27 and again at this show. Maiden had sold out, and rumor had it that Paul Di’Anno, Maiden’s singer, was pulling fans in through the dressing room window. The band’s attempts at showmanship were evident even at this early stage of their career, with a roadie emptying a fire extinguisher through a crude cardboard cutout of Eddie, the band’s mascot’s, head, which was stationed above the drum kit. Want to add your memories of concerts at the De Mont? Fill out the form below! This entry was posted in Aya Gooin' Down De Mont?, Thoughts from the Guv'nor and tagged AC/DC, Black Sabbath, De Montfort Hall, Genesis, Iron Maiden, Leicester, Lynyrd Skynyrd, Oral history, Peter Frampton, Peter Gabriel, Rainbow, Rock music in the 1970s, Sky, The Jam, Uriah Heep, Van Halen. Bookmark the permalink.